Family owned and operated since 1990 with over 100 years of combined service. Sparks Computerized Car Care in Muncie, IN offers dependable auto service backed by a 24 month / 24,000-mile warranty. We are not your average auto maintenance and service shop. Providing the best repairs as well as outstanding customer service is our goal. 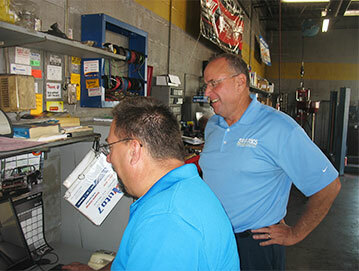 Our team is comprised of ASE Certified Technicians and Master Technicians. From oil changes to diagnostic trouble shooting our technicians can handle any auto service or repair you may need. Unlike your local dealership, we work hard to provide outstanding personalized customer service and repairs at a fair price. Using nothing but the latest tools and technology available, our team is able to diagnose and fix problems quickly and more efficiently. Stop by anytime and see why Sparks should be your new dealership alternative. Timely tire service and repair is just one of our many specialties. Many people do not pay attention to their tires until it’s too late and often replace them earlier than needed. If you keep your tires properly maintained they not only improve fuel efficiency but also last longer. This includes tire rotation, pressure, balancing, and wheel alignment. Altogether, these few services are relatively inexpensive and will save you time and money in the end. Stop by anytime and see why Sparks Computerized Car Care should be your local dealership alternative in Muncie, IN. Dependable auto service and maintenance, every time. Walk-in and same day service is available. Please call or schedule service online.